Despite impact on her career, ex-martial arts champion decides to take her skills and fight terrorists so as to defend Jerusalem. Noy Peles has been training for combat for the last ten years. Peles is a skilled former MMA (Mixed Martial Arts) champion, but last March she enlisted in the IDF and chose to do her service in the Border Police despite the impact her choice would have on her martial arts career. “Even though the strict training regimen doesn’t allow me to continue taking part in professional competitions, I have no doubt that I’ve achieved my true dream,” said Peles, who now holds the rank of lance corporal. 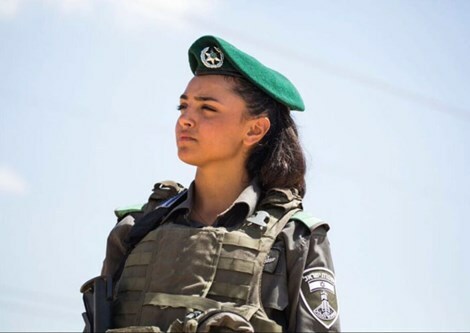 After finishing basic training with outstanding marks, she now serves as a squad commander in a patrol unit stationed in Jerusalem, which has been a focal point in the recent Arab terror wave since last September. But Peles is indomitable, saying, “no battle is too hard, and no opponent is too strong” – a lesson she learned in the MMA ring. According to Peles, she didn’t hesitate with the decision to join the Border Police, despite the impact of the intense military service on her ability to focus on her martial arts. Peles first got interested in martial arts from the influence of her younger brother Itzik, now 16-years-old. When she was eight-years-old, he enrolled in an MMA course, and for two months she would come with him to every class and watch from the side. A few months later she decided to become a martial artist herself. Previous What was the worst pick-up line a guy ever used on Mercedes Terrell?